I finished the blocks for my upcycled blues #10, otherwise known as Crumbs 2 for the year. So far this year I've made 2 strings tops and 1 crumbs top. This will be "Crumbs #2". I left the bobbin there so you could see the size of the roll I made. Thankfully it was enough to make all of these blocks today. I already had enough of the narrower tape sewn up. 1. I sewed a lot of pieces on to the wide adding machine tape that I have. The tape is almost 4" wide and actually uses up quite a few scraps and misc. odds and ends pieces of blues that I cut off from my other projects that I've finished so far. I actually did this on Friday when I was having trouble concentrating on much of anything. 2. Finished up the other 5 blocks needed for the top - I had to have that stuff sewn to the wide tape before I could make those blocks. These are the 5 rather large blocks I got finished. They are over 20.5" square. I have a total of 9 of these blocks. In the blocks I have two sizes of adding machine tape. The inner round uses the smaller size - about 2" wide - and the outer round uses the kind that is almost 4" wide. The center square started as a 4.5" crumb block. The strips are cut 1.5" wide. And that's all I did. It's not just a tiny bit, but it wasn't as if I spent all weekend on it either. I have all 9 blocks finished that I need for this plan. I will now start working on sewing lots more misc. pieces to the wider adding machine for the border section. I will need between 350-400 inches of it. I'll also go ahead and cut my pieces for the sashing and cornerstones and navy borders - (I need the navy for another project, so I'd like to go ahead and reserve what is needed for this one before I cut into what's left of that duvet cover for yet another top). This bag that I'm using to sew on to the adding machine tape is pretty good sized and is over half full of scraps - leftovers from the recently made tops. I may dig through them some more and cut 1.5" strips from them as there are many pieces large enough to do that. We'll see. I really do have a lot of leftover scraps of these blues. I have the cut offs of my side setting triangles for the blues tops that were put on point. I also have misc. pieces of shirts that included curved edges of shirt tails, etc. These cut offs are perfectly good pieces of fabric but they are not nice square pieces. I have a LOT of these scraps. I may go ahead and just make up a bunch more crumb blocks next - as I have all of these pieces segregated from the rest of my misc. scraps designated for crumbs/strings. I intend to keep using them in these special projects until I use them up. I've gone kind of crazy with this project, I think. 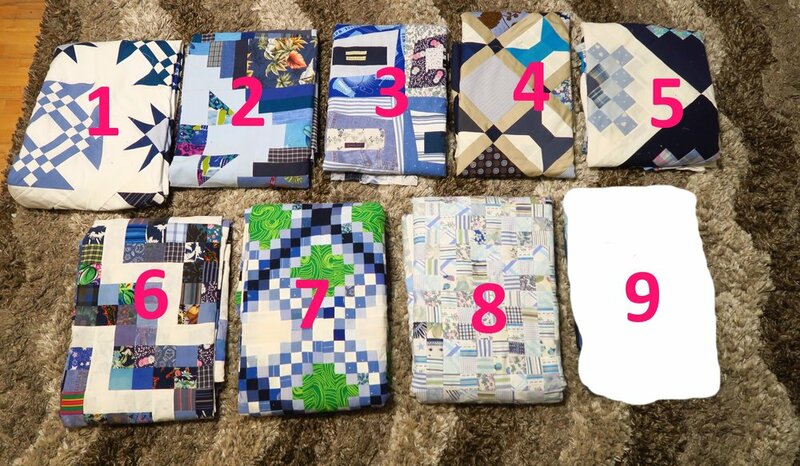 So far I've made 9 tops of out my upcycled blues pieces of fabrics which were mostly men's shirts, but also ladies' blouses, skirts, pjs, curtains, duvet covers and sheets. from upper left - 1. Starring Monkey Wrenches, 2. Periscope, 3. Premium Labels, 4. Peek a Boo, 5. Granny's Checkerboard, 6. Scrappy Rail Fence, 7. Triple Irish Delight, 8. Made Ya Look - at Blues, 9. not revealed yet. All of these are from all upcycled materials. I'm working on getting the backings put together, also from all upcycled materials. I've shown you 8 so far - Number 9 should be coming this week - and I'm actually currently working on top Number 10 - this crumbs one. Plus I have started working on number 11 which uses 3.5" squares. Number 12 just got started as well with the first blocks made. Number 13 is in my head and it is a top using many different shaped pieces. I keep finding "goodies" to go in it. I want to include embroidered pieces, extra blocks I made plus some pockets and more labels. Because I managed to find quite a few more blues as I was straightening up my daughter's room to make room for her as she came back for Christmas, I decided to plan 3-4 more and try to get them done. Unfortunately I won't "feel" done until I get them down to the 2 boxes of blues that was my original goal. We'll see how it goes. So this little project that I thought would entail about 7-8 tops so far is 9 finished with potentially another 7 or 8. Hmmm. Hopefully you are liking this journey through my blue upcycles are much as I am. I really am enjoying the creative challenge to use these up in a variety of patterns. But be sure to check out what my sis has for you over in the store. She's been busy moving, but she knows where all her fabrics are, feel free to order!